And Ice, From your description it does sound like you're differentiating them quite well, though I still worry that the two farms are going to feel similar. They may have differing objectives, but if the actual maps themselves feels like rehashed versions of each other, it defeats the purpose. Parhaps making them two different kinds of farming communities? Farm 1 could be a group of farms spread over a wide area with an acre or two of crop fields in between, while Farm 2 could be more of a plantation-type farm, with larger, closed-off communities with large pieces of land and support structures littering the single farm it would take place on. As Farm 2 would be a sort of compound, it would also be able to realistically hold militia members in hiding, with complete self-reliance and autonomy. Would it be possible to combine the two town maps into one? Have a single town map where we have a boat dock , a slum area, residential zone, and bazaar, with plenty of differing building styles. The residential areas would be filled with large, but simple homes, the slims fille dwith shacks, the bazaar filled with the latest technological advances, and warn-down, but functional and intact buildings at the docks. Think of it in terms of the Elder Scrolls IV... Slums is Bravil, Residential is Bruma, Docks is Anvil, and bazaar is Imperial City. Just in a small Star Wars town. That would free up 5 for a possible ambush of the clone forces in the valley. Militia troops advance from the town to retake the factory and get their informant back, and the Republic lies in whait until they are in the plain, then they attack in a U formation, trapping the militia. The Militia would have expected something like this, and pulled out all the stops, though the republic still wins and forces them back into the town, where they expect to fight until their dying breath...not content to let the Republic win as long as any of the Militia members breathe. Militia fights tooth and nail in the town, using tactics and ambushed they hadn't used before. The fiercest fighting in this particular campaign lies in that town, not because it's strategically important, but because the Militia have allowed themselves to be cornered. The Militia's only hope is to get as many people as possible loaded onto a small fleet of boats, to cross over to Silver Beach. The Republic tries to cut them off from the boats, but a couple boats have already launched, which is why the Militia was able to create such impressive defences to stall the Republic attack on the beachhead. Yes, I have way too much time on my hands to be thinking of military strategy in the middle of the O'Dark Stupid hours of the morning. Well to go on this whole conversation, there is no way to force players to play the maps in their order. So it doesn't really matter too much, nor does arguing ideas really help in the first place. But onto a topic that more benefits the actual creation of the mod, just give me basic map layouts you want and types of maps (plus their respective models and textures) and I'll get started on them as soon as you do. @Revan - Design how you feel the map should be at Point High Hym. The Zig Zag thing sounds good. Tanks, if ya need em, they can land there too. @Ajax - sure we cn do the farm feilds that way. As for the towns. We can do it that way too. Combined it to 1 town. Bob does have a point there. We can't force players to play in a paticular order. But with a good story they may LOL!. @Bob - Yup, just working on the layout of 1 of the maps, and I'll forward it to you. Rathia is a planet bigger then earth revan and I decided awhile ago. So Planty of militia to go around. I might as well post the full picture. 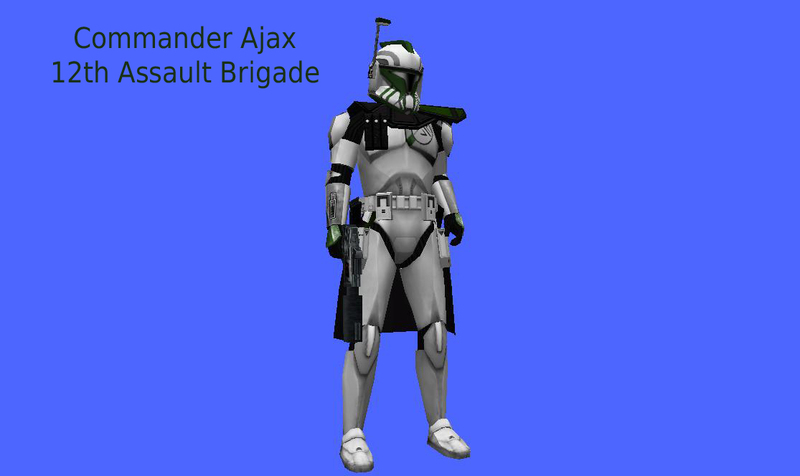 I present to you all, the commanding officer of the 12th Assault Brigade, Commander Ajax. But forget the formalities, why don't you guys talk to him face to face? Heres the 31st Calvary. They will be on Parolis after being called in for assistence. Here's a 12th Airborne Trooper. Ajax, I hope you like, because I spent a considerable amount of time on it. Not as long as I did with Cmdr. Ajax, but I went off descriptions alone and you weren't specific about the single green mark on the chest plate, so I just did a line down the middle. Simple. And it's not like there needs to be an overwhelming amount of colors anyways. Yes, the silver lines ARE there on the shoulder pads down to the forearms, just like the EP2 style trims. Though I made the gloves green, figured there needed to be some color besides just silver. I WILL be re-doing my skin. Higher quality, etc. However, I would like the same model, just nix the part of the pauldron on the left of the picture and it's exactly how I want him. 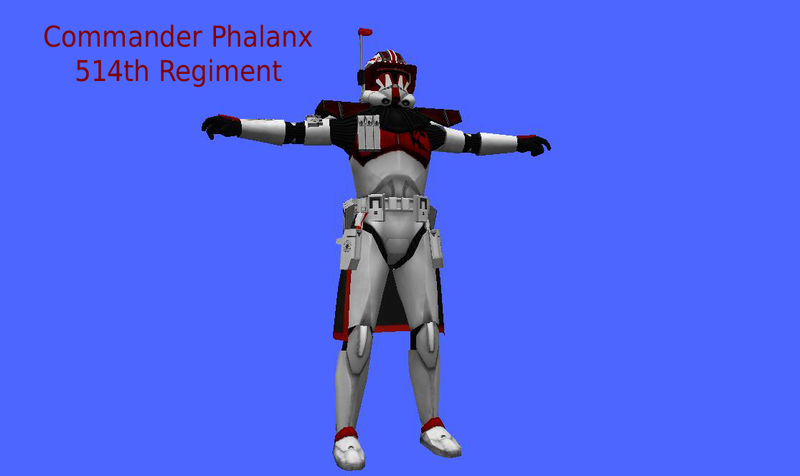 I am very happy with Commander Ajax, he went through about 8 different WIP variations on the helmet alone, though the rest fell in place almost immediately. As for the 12th AB Paratrooper, I notice, and appreciate, the silver on the arms and the green on the gloves, I like that touch. The green line down the middle, I like it, but one tweak is to perhaps continue the green line down the center of the stomach piece, so it ends invisably at the belt, rather than visibly on the chest armor, and another thing to experiment with for another varient would be to have the green on the chest arc out and end at the armpit, rather than the neck. I like the single line, and I'll keep it, but another varient wouldn't hurt. If you are going to end the green at the chest plate, why not try something different, and have the green ring the seams? So there's green at the armpits, neck, and the bottom of the chest piece? That would make it instantly visably different from other Phase I clone armors, as well as serving to add more variety. Also, I'll make up a new Unit Logo for use, one that uses silver, black, and green, so you can place that on the skins, too. Excellent work guys 8) . @ Ajax: I'll get to fixing that momentarily. However, I would appreciate if you could do a little bit of a diagram of the changes you want in Photoshop and I will hop to it. This was just the basic trooper. Of course there will be variants. @ Ice: I'm probably using this style of clone for reconnaissance. It would really fit in with any group, the way I see it. Unless you have an ARF I can use. @ Everyone: Technically, everyone already saw Cmdr. Phalanx. However, I will be making a new version soon. Thanks everyone for their feedback. I will be making more skins as time progresses. 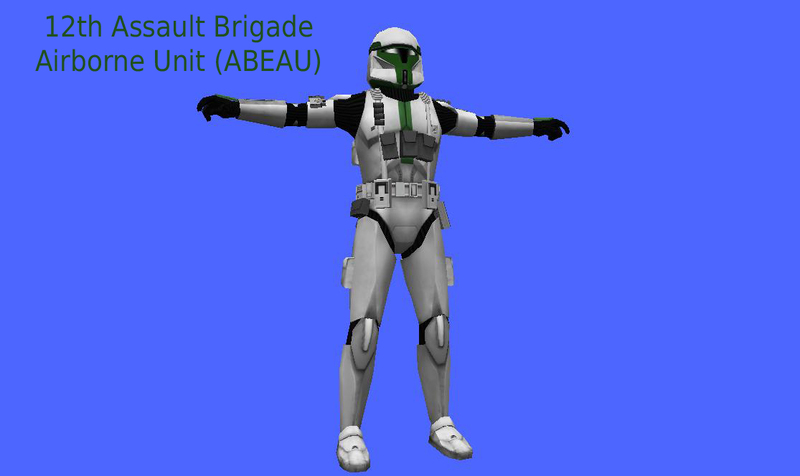 scout trooper variants (41st elite variants). I was looking through the posts and I saw the beach landing. There was one open spot, I was wondering if Jem Squad could take that beach or if not be attached to another unit, Jem squad is small so it doesn't always work alone. @ Ice: Oh by the way. For the weapons, do you want them better or worse than stock? @ARC_troopa_Nate DL testing rounds. You will know what were going with. Also the weapons system is a wip. These are what will go by for now. Incase ya want to know how many, how strong, what do I name it, who gets what. Some logic, some no logic. Mix and match names lol. Also we dont need to have 10 classes lol. Just somthing to go by to make thign easier. And i know some may see it different, but plz dont argue lol. Make sure your deisgns are none the same from 1 another. (2nd cant look like the 709th) LOL! Colors how ever can be the same. So thats why I choose a 7th Star corps. Will be landing with Infantry and Tanks. 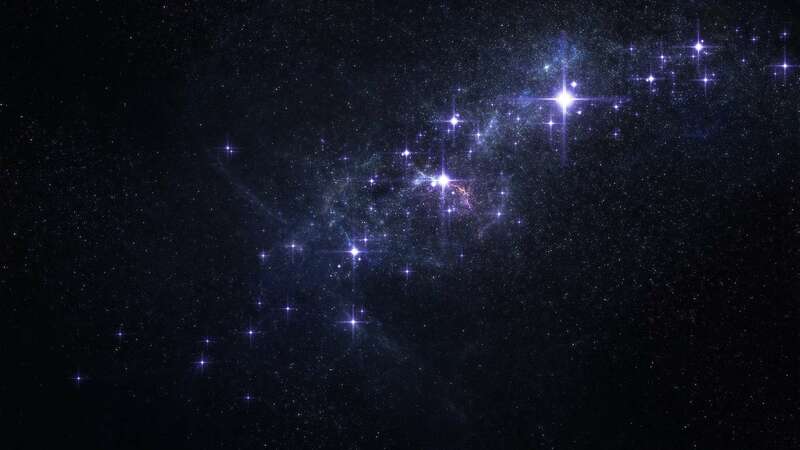 Then from there will seperate from the 7th SC to the 7th Elites (soldiers). Also, on the 'sniperman', I'd figure it'd be either "Marksman" or "Designated Marksman", or just simply, "Sniper", because Sniperman makes 'em sound like a super hero. "Hi. I'm Sniperman. I'm here to snipe your troubles away! BANG! GONE!" But that's more of a small nitpick than anything. lol 8) Awesome category lists, though. Really enlightening. Yeah. thats what i was thinking. sniperman, sniperman, does whatever snperman does. Now that I think about it, that's a funny idea for a super hero. Either one works. Marksman sounds better thought. Its really up to the 1 building the sides thought. This is just direction. I figured that, Commander. But ya can't help but have a little fun. Awesome list, regardless.